In our new quest to bring you real news, which we have mostly given up on already, we did want to share this important update which we found on the website of Aububon Vermont yesterday, April 1st. 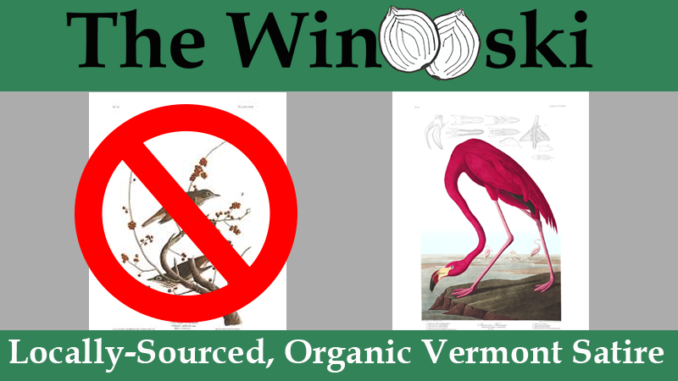 HUNTINGTON, VT (April 1, 2019) – Audubon Vermont has a plan for impending changes coming to Vermont in the face of climate change. “We figure, if you can’t beat ‘em, join em. Our world leaders certainly aren’t going to do anything about [climate change], so we will”, says Education Program Coordinator Debbie Archer. The plan is to radically shift the state’s thinking on a warming planet. This is Audubon Vermont’s new plan. “Let’s embrace the warming temperatures, the shorter drive to the ocean, and the increased value of our land for those who will soon be homeless down south, “ says Executive Director David Mears. “We’ve come up with a multi-tiered marketing strategy to really sell the state to those who haven’t considered Vermont before,” he continues. The 1,500-page plan offers solutions to several struggles the state has seen over the years: declining population, too much snow, and algae-filled Lake Champlain. The crown jewel of the plan is a new state bird. At the Green Mountain Audubon Center in Huntington, Center Director Kim Guertin meets with educators Rae Bronenkant and Gwendolyn Causer this April 1st. They are working on updating education materials to include the flamingo. Image Credits: John James Audubon. Speaking of pink flamingos, does anyone know what happened to the large flock of pink flamingos that used to summer in a pond in Leicester just off Route 7? They showed up every year, then suddenly they stopped coming. I miss them. Do you think global warming will bring them back? They have moved north for a more temperate climate. When the Lord High Editor was young, he had a thing for flamingos. I think you should check his garage for the missing pinks.